Experts of CPi Patent and Trademark Management System. Computer Packages Patent and Trademark Management Systems keep track of your invention disclosures, patent and trademark portfolio and generate critical due dates. The systems are customizable and are easy to use. Below are some of the features that help you reduce keying labor and maximize safety in managing your invention disclosures, patent and trademark records. The system provides you with an instant due date list upon computer start-up. Each attorney can control the actions on the due date list. 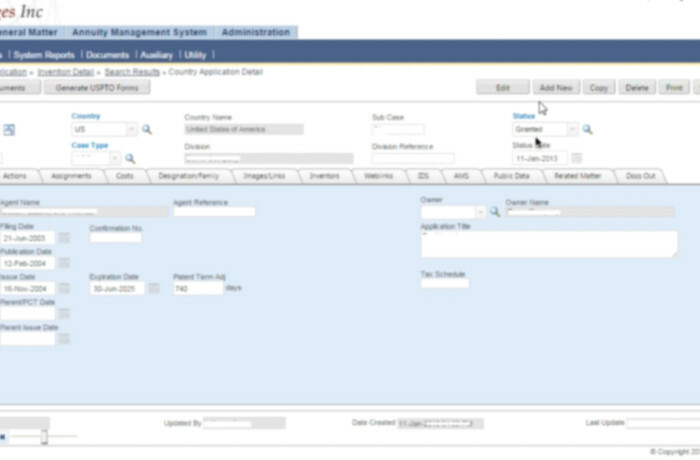 Cases due can be organized in a variety of sorting orders and past due actions are flagged. Central docketing can monitor due dates for all attorneys and easily enter completion dates. Relationships of your trademark and/or patent family including CIPs can be easily viewed in a tree structure. Web Links allows you to see current and complete patent and trademark information from the web by directly linking from your patent and trademark system case to the equivalent case on the patent & trademark office sites (i.e. Patent - PAIR, Espace and over 80 patent office sites; Trademark – Canada, US, Switzerland, and other trademark office sites.). It eliminates the need to format search numbers in a separate internet session. Disclosures, patent and trademark applications, logo, drawings and correspondence can be attached to your system. From within your patent or trademark system, this feature allows attorneys to send messages to central docketing. Reduces the difficulties of distributing and running due date list report. It provides due date list report via email to attorneys who are traveling. Calendar format is available for easy viewing of your due dates. Statistics Provides management with a numerical and/or graphical picture of filing and grant activity by business unit or client. Letter Generation Removes keying risk by generating letters using the current information available in your system.